I’ll admit, this is nothing more than a slightly adapted recipe from Food Republic. But sometimes, someone else’s recipe just works and there’s no real reason to tweak it. I made this dish…well, before Europe…actually, I think it was right after New Year’s (oh my) since I used this amazing in-house spinach tofu from H Mart in Atlanta. Spinach tofu! Why don’t I have an amazing super-huge Asian grocery store at my disposal? This green block of tofu was the bomb, not only because it was beautiful, but also because it had that nice, leafy taste in it too. The marmalade glaze on the tofu really amped the recipe up a notch or two as well. On dark and dreary days (or rainy, at least), sometimes you just want a pick-me-up. This recipe is bound to do it. From the bright, fun tofu (not that regular white tofu won’t be grand in the recipe too!) to the roasted orange glaze to the bed of spinach and quinoa that the tofu rested on–it’s simply a winner. And don’t slack off, be sure to add the carrots and cashews on top. They add the perfect little punch of texture and crunch to the entire dish. Cut each block of tofu into 1/2″ slices crosswise. Blot well between several layers of paper towel or a clean tea towel. Combine orange juice, lemon juice, Bragg’s, marmalade, mustard, tarragon, and a pinch of fresh black pepper in a small bowl. Whisk. Arrange the tofu in a single layer on a parchment-lined roasting pan. Spoon the marinade generously over the surface of the tofu. Roast for 15 minutes, or until the tofu begins to turn golden. Carefully flip the tofu with a spatula, and spoon more marinade over the surface (you will likely have a bit left over). Roast for 15 minutes longer, or until the tofu is firm and golden. Meanwhile, heat the oil in a small skillet. Add the carrots, garlic, ginger, and cashews, and sauté over medium heat, stirring frequently, until both are golden. Stir in the curry powder and remove from the heat. When the tofu is done, sprinkle the carrot-nut mixture over the tofu and serve with grain and green of choice (I used quinoa and spinach sauteed in oil with some garlic). Marmalade glaze for the win! I clearly need to try this one out and compare it to the salmon, right? That looks amazing. Why does my H-Mart not have spinach tofu???? I guess I’d better make it myself. Check for it in the fresh tofu section of the store…I’d never seen it before so maybe it’s a once-in-awhile thing. Love the soft fresh tofu they make too! 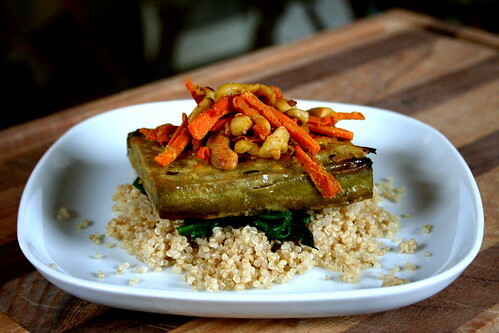 Totally jealous of your fancy spinach tofu. There just needs to be more Asian markets in general! The closest one to me is a 45 minute drive, each way. Such a bummer. I’d still be plenty happy making this recipe with regular tofu, though. I happen to have two blocks of tofu in the refrigerator right now. Might try to make this and put it in front of my husband and see what happens. It looks wonderful. Wish I had spiniach tofu. That sounds lovely! And it looks beautiful too. Looks fantastic! Will be making this one. Love tofu.